Harvey, Murphy, and Collins lost the World Series for the Mets. A complete and depressing rundown of who bungled the World Series for New York’s beloved team. 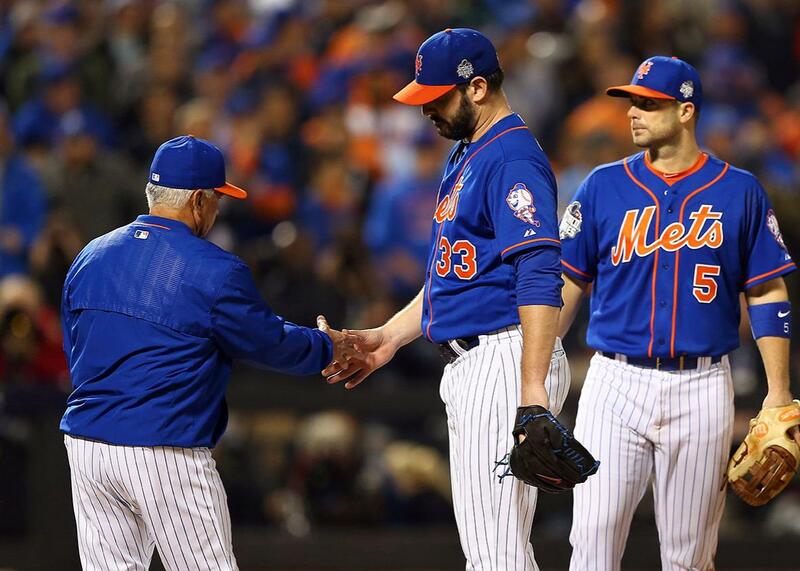 Matt Harvey of the New York Mets was relieved in the ninth inning against the Kansas City Royals during Game 5 of the 2015 World Series at Citi Field, Nov. 1, 2015. A lot of the blame in the New York press has gone to Matt Harvey, who insisted on staying in the game past his expiry date (the New York Post already ran a column calling for him to be traded), and to Mets manager Terry Collins for succumbing to pressure from Harvey and Mets fans to leave him in. But there is plenty of blame to go around. The Mets failed teamwide on so very many fronts, from fielding, to relief pitching, to hitting. The Royals won this World Series more than the Mets lost it, but if in your day-after wallow, you would like to assign individual blame, here is a ranking of Mets scapegoats from least culpable to most culpable. Despite making himself the focal point of the Game 5 loss, the Mets ace deserves very little blame for the Mets losing the World Series. Up to that ninth inning, he was pitching one of the all-time World Series gems, striking out nine batters and conceding just four hits in eight scoreless innings of work. He had retired six straight hitters and 17 of 20 when he demanded his number be called again. Harvey, though, seemed to be motivated by something other than simple desire to close out his win. He told his manager Collins, “I’ve got to have this game.” The implication from Collins in his post-game interview was that Harvey needed it because of the criticism he faced earlier this year for wanting to shut down his season early because of his Tommy John surgery. (He ended up continuing to pitch, but only after a fevered backlash from Mets fans.) If blind machismo is the inspiration for his ninth-inning appearance, it’s reason to put Harvey on this list, albeit at the bottom. The truly decisive play in Game 5 wasn’t actually a Harvey ninth-inning pitch. The Mets still had a one-run lead and a chance to close out the win when Harvey left the mound. The critical moment came with one out and the Royals’ Eric Hosmer on third base when Salvador Pérez rolled a slow grounder to David Wright. The Mets third baseman momentarily froze Hosmer at third and then made the play to first. That’s when Hosmer took off and Mets first baseman Lucas Duda—who should have easily nailed Hosmer at home plate and ended the game on a double play—sent his throw to what might as well have been another borough. The 26-year-old fireballer set an ignominious World Series record by blowing three save opportunities. But it’s hard to fault Familia too much, having come into those situations in terrible positions—with a one-run lead in an emotional opening game against Comeback City, relying on Daniel Murphy’s glove in the eighth inning of Game 4, and leading by only one run with nobody out and a runner on second in Game 5. Familia ultimately pitched five innings and only conceded one earned run with a 0.60 walks plus hits per inning pitched, a fine enough line. But that one run was a game-tying homer in the bottom of the ninth inning of Game 1, an inflection point for the entire series. Here is a summary of Clippard’s World Series pitching performance: Four base runners and two earned runs allowed in two innings of work and an aching sense of dread in the stomach of Mets fans every time the team got to the eighth inning with a lead. Murphy’s main on-the-field crime was his fluffed grounder that cost the Mets a one-run lead and ultimately a chance to level the series at 2–2 in Game 4. The Game 4 mistake was the sixth-costliest error in World Series history, knocking the Mets’ chances of winning the title by 13 percent according to Fangraphs. The Mets hit a hideous .193 team average and had a wretched .552 team on-base plus slugging in the World Series, well below their slightly less horrible regular season marks of .244 and .712. Céspedes, who the team acquired in a midseason trade and whose bonkers second-half numbers inspired their run to the postseason, was supposed to be the Mets’ salvation at the plate. Instead he hit .222 with a .584 OPS in the postseason and .150 average and .293 OPS in the World Series. Céspedes also made terrible and costly plays in the field and on the base paths. Had he played Alcides Escobar’s Game 1 opening drive off of the wall rather than bouncing it off of his glove, it would have likely resulted in a triple rather than the first World Series leadoff inside-the park home run in 112 years. In Game 4, with the Mets down 5–3 and attempting to stage a ninth-inning rally, the game ended on Céspedes’ stupid running mistake. But keeping in Harvey wasn’t Collins’ only failure. In Game 4, he pitched the risky Clippard in the eighth when he had Familia available for two innings. In the previous game, he actually pitched both relievers completely unnecessarily with his team up by six runs, which is perhaps why he was gun-shy to put Familia in for two in Game 4. Finally, Collins’ refusal to pinch hit for the clearly injured Céspedes with nobody out, the bases loaded, and the Mets hanging onto a one-run lead in the sixth inning of Game 5 was perhaps equally costly as his late-inning pitching nonmove. The Mets lost as a team, and the Royals won as a team. But if you’re looking for least valuable performances, that’s all Mets.